A Sipes family (Tamara and Daniel with Sophie, 9 and Max, 8) tradition is to take our boat, the Tamara, from San Diego (Mission Bay Yacht Club) to Avalon Harbor, Catalina Island after Christmas and stay through the New Year. 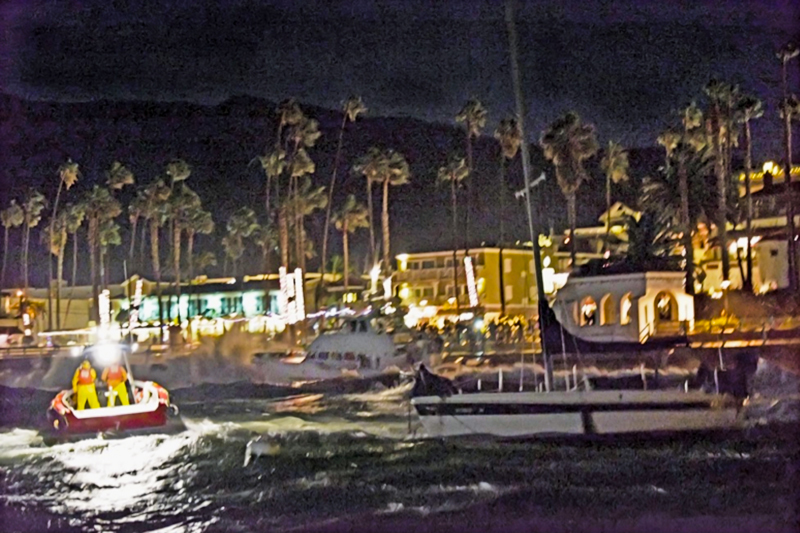 New Year’s Eve on Catalina is rather popular with many events, including a black tie affair at the Casino. As such, the number of boats in Avalon Harbor swells for the holiday. On December 30th, 2014 the weather forecast called for mild winds (5 to 15 knots) from the North East. I have been through several of these “Santa Anas” while boating at Catalina and the northern Channel Islands. Twice they have been severe enough that the harbor master called for everyone able to leave the anchorage to return to the mainland or seek out alternative shelter. Once I rode out a Santa Ana at sea – mostly in Santa Monica Bay. It was an exciting night with strong, warm winds and steep seas but my Cal 25 sloop handled it well. However, this time the weather forecast was such that there was no advisory to seek alternative shelter. The harbor has several hundred mooring buoys. The moorings for larger boats are well spaced on the “outer” edges of the mooring field. Moorings for smaller boats, like our 34 foot Meridian powerboat, are more densely packed toward the back of the mooring field. Some moorings are more exposed to North East winds than others. We were on buoy 103, which would be very exposed to the wind and waves and requested to move more “inside” the harbor. I was told there were no “good” moorings remaining but buoy 62 was available. This buoy was only marginally better protected but was in shallower water and closer to the sea wall – not good if the seas became large and breaking. I still elected to move to buoy 62 as it should be a bit more sheltered from the predicted wind direction. Since the forecast was for mild winds, we were really only talking about comfort, not survival. However, we decided that it would be best for Tamara and the kids to move to a hotel in town so they could get a good night’s rest. We took our dinghy ashore in calm weather at about 5 PM, had dinner at Antonio’s Pizzeria then checked into the Glenmore hotel. I spent some time with the family, said good night and left for the dinghy dock. I told him I had four singles or a twenty. He said, “Tonight, four dollars is fine.” He brought me to The Tamara and wished me good luck. The wind was blowing maybe 20 knots and the seas in the harbor were increasing – now 4 to 5 feet and steep, arriving every 5 seconds or so. I tuned the VHF radio to channel 12 – the harbor patrol. From the conversation I immediately determined that Baywatch had one or two boats in the harbor on standby in case the situation worsened, but one of them was, hopefully temporarily, out of service with a mooring line “wrapped” on the propeller. They were trying to free it. People were also on the radio asking to get off their boats but the shore boat had stopped running. They were asking the harbor patrol to get them off their boats. The harbor patrol responded stating they were trying to secure the harbor but would get to them in time. The “Catallac” a 50’ party-boat catamaran, asked for assistance to secure to a second mooring. They were in the outer harbor, and it was a very good idea to do this. The harbor patrol helped them. So now the Catallac had two lines securing the bows and two securing the sterns. I went up to the bridge and saw the free-floating boat, banging into other boats. Then the harbor patrol arrived, got a line to the bow and towed to a calmer part of the bay by the Casino. I noted the sea wall was only about 75 feet behind me. If my mooring line parted I would likely be in the breakers and smashed against the wall before the harbor patrol could arrive. I climbed down from the bridge and went on my bow to check the mooring line attachment to the cleat. All looked good and I had, earlier in the day, attached another line to the loop of the mooring line and also to another cleat on the boat. In this way, if the cleat should pull out we would still be attached to the mooring. However, the Tamara’s mooring was very loose – the stern and bow lines, from the anchors below, were too close together. That allowed the Tamara to float too close to the boats on either side but more importantly it did not always face directly towards the oncoming seas. The Tamara would get somewhat sideways thus increasing the stress on the mooring lines when waves would hit. My neighbor to starboard, Richard Bertram, on a 37 foot powerboat, placed his Achilles dinghy between our boats and I also placed fenders forward. I started the generator to top off the batteries and also started the engines. By this time the harbor patrol was swarming around the King Neptune with three boats. They put personnel on board and secured a line to the bow and towed it off the trawler and headed to the calmer part of the harbor by the Casino. Then the towline parted. They secured anther line and started to tow. Then it snapped. The King Neptune once again was drifting through the anchorage and again hit the same trawler, this time a glancing blow. The Harbor patrol repeatedly tried to take it into tow but the lines would just break. A voice of a harbor patrolman on the King Neptune said, “I’m trying to start the engines.” On board was 39 year old harbor patrol officer Timothy Mitchell – a Kiwi who had moved to Catalina in 2000 and worked on this very boat as a SCUBA instructor. He served on the volunteer fire department and eventually joined the harbor patrol. Getting the engines going was the only hope to save the boat. But it was too late. The King Neptune hit the seawall about 100 feet astern and toward the Green Pier from my boat. The waves were pounding, rocking it violently. A crowd gathered on land – now only feet from the King Neptune. The stern of King Neptune was very close to steps that are used by swimmers to enter the water in calmer times. Then I heard over the radio, “Tim fell off the Neptune and is in the water!” I hoped he could get clear and not be pulled under the boat by the tremendous suction that develops under such conditions. Then many in the crowd ashore screamed and I could tell by their expression some gasped. Many turned away but some leaned in further. I knew what had happened. Every patrol and Baywatch boat in the harbor raced over, but could do nothing due to breaking waves. The harbor patrolman’s body would be recovered later that morning. The King Neptune would be reduced to debris in less than two hours. The engines remained in that spot. The rest of the boat and its contents spread throughout the harbor, with many parts thrown by the waves onto the city streets. The harbor stank of diesel. Two other boats, both trawlers, went ashore at about the same time. But they went onto the beach rather than against the breakwall, so fared somewhat better. I re-assessed my situation. With the breakwall directly behind my boat I realized that if my mooring line should break I would only have seconds before the boat swung, connected by only the stern line. In this position, the breaking seas would come over the transom, flood and sink the boat quickly. So I would need to start the engines and cut the stern line as quickly as possible. I put my largest and sharpest knife by the salon door. I already had a lifejacket on but took off my shoes (much easier to swim without shoes) and put swim fins by the salon door. I took the boat registration and insurance papers, folded them and placed in my back pocket. I attached a water activated strobe light to the shoulder of my lifejacket and put a water proof flashlight in my jacket pocket. My plan was, if the mooring line should break, to first try to motor out. Even if I got out of the breakers I would need to navigate through many rows of closely packet boats on moorings. With the large windage of the Tamara, I would not have good control and might hit other boats or get a mooring line wrapped on the propeller thus disabling the boat. Alternatively, if the boat was heading to the seawall quickly, I would jump into the water and swim to the calmer part of the harbor where I could climb out or be picked up by a harbor patrol boat. Anything to avoid being on the boat pinned against the seawall awaiting certain destruction. Around midnight or so the winds and seas seemed to go down a bit but then around 1:00 they picked back up. Then I heard on the radio, “Epic is free!” Epic is a large luxury sportfisher, maybe 65’ long. The mooring line had been attached to the windlass on the bow – a very strong attachment point – designed to deploy or retrieve the ship’s anchor in all conditions. But the windlass pulled out of the deck setting Epic adrift. I watched as the harbor patrol chased Epic down, put a man aboard and secured a tow line. This time it went as planned and Epic was towed over by the Casino and secured to a dock. Then another boat came adrift – a ~60’ pilothouse motor yacht – I am not sure of the exact make. It was moving quickly through the harbor, about to move into a densely packed area of smaller boats. Two harbor patrol boats rushed to it and were determining a plan of action when the operator came on the radio and said, “I’m going to try to get the engines going.” A harbor patrol boat pulled alongside and a man attempted to step aboard just as the owner put in gear and revved the engines. The yacht lunged forward and harbor patrolman missed his mark, ending up in the water and luckily missed the powerful propellers. The harbor patrol boat had to move around several boats before returning to the patrolman in the water, but he was brought back aboard. “Seaview is free!” This is the glass bottom boat. Fairly large, heavy and very wide. It bounced off a few boats before being secured and side-tied to another vessel, still in the exposed area of the harbor. Too bad for the vessel to which it was attached. “Harbor patrol, this is Susie Q. We are free and in need of assistance.” This family had been next to us an Antonio’s. What appeared to be three generations of family. The grandparents, the parents (one with a jacket embroidered with “Susie Q Crew”) and grandchildren. I was on the bridge and saw Susie Q, a ~40 foot Hunter sailboat, spiral off her mooring – stern to wind and waves. Her engine was on. She looked in good shape. It looked like she was going to pass the ~35’ Tiara powerboat on mooring 105, round her stern, then could head out to sea. But instead she turned sharp, attempting to pass in front of the Tiara. The wind and seas were too much. She could not get her bow into the wind. She collided, at speed, with the bow of the Tiara. Susie Q then backed off, tried to go forward but could not. Her propeller was wrapped and the engine useless. She seemed stuck to the Tiara, with her stern to the waves. The harbor patrol came by to help. Eventually a line was attached from her bow to the stern of the Tiara. The stern of the sailboat was let go and she floated around – attached by the bow to the stern of the Tiara. The strain on the line was tremendous. When a wave would pass under the Tiara and to the sailboat the line would snap taught, but not break. Then, often, the bow of the sailboat would smash the stern of the Tiara. Eventually the back of the Tiara started to disintegrate. The bow of the sailboat developed a huge V-shaped hole. If the rope should break, it was unclear whether Susie Q would go aground on the beach or hit the breakwall. Susie Q was also in danger of sinking. “That Cigarette boat is free!” A 42 Fountain speedboat came detached from its bow mooring and swung into a sailboat two boats in front of me. I could see the situation clearly from the bridge. The speedboat seemed to be still attached by its stern mooring and was banging into the side of the sailboat. I heard a particularly loud “thud” of the two boats coming together then screams and yells from the man aboard. His wife came on the radio, “His finger is gone! He is hurt! We need help!” Ordinarily I would have taken my dinghy over and rendered assistance, as most people would. But I just felt helpless, seeing him motionless on the swim step with no means to get over there. I shined the boat’s spotlight on the sailboat’s swim step to aid the harbor patrol in locating him, and also in case he passed out and fell into the water. The harbor patrol arrived quickly and evacuated him and his wife. I saw an ambulance and fire engine race to meet them by the Casino. A large trawler, maybe 55 feet, came loose. The owner was trying to get the engines started – probably the only way to save it. The Harbor patrol was busy with other emergencies, so was not immediately available. It was up to the owner to get the engines started and get out of there. Just before the water was too shallow, it appeared the trawler was starting to move under its own power. It takes a tremendous amount of power, and some time, to get a boat that size to turn into the wind. It was too late. It hit the beach and washed ashore. Quickly the seas broke open the side and flooded the interior. Destroyed but no lives lost. Throughout the night an ambulance and fire engine, red lights flashing, would occasionally run out to the Casino stay a few minutes and then run back into town. I assumed they were tending to those few people who were able to be evacuated from their boats. These emergencies went on and on throughout the night. Sometimes a sort of rhythm would develop and it seemed the worst was over. Then all in the anchorage would feel a particularly large wave move through mooring field (sometimes noted on the VHF “that was a big one”) followed by the “so-and-so is off the mooring!” alerts from nearby boats. Dinghies frequently blew through the anchorage to be demolished against the seawall. At graylight the wind and seas had greatly diminished and the destruction apparent. Three trawlers on the beach. Most of the townspeople, and the media, never saw the massive King Neptune against the seawall. It was reduced to rubble well before dawn. But the harbor was full of its debris – thrown onto land, floating throughout the harbor and below the surface. Most of the wayward dinghies were destroyed, in bits. But interestingly their outboard engines could often be seen near the seawall, a foot or two below the surface, sitting on the bottom. The mast of the sunken sailboat arose from mooring 103, our previous mooring. I’d guess that 50% of the boats in the harbor had damage. Sadly, while searching for the harbor patrolman, another body was found. He was 53 year old Bruce Ryder, a well-known Avalon resident that lived on a boat in the harbor. The wreckage of his demolished powerboat, Ocean Ryder II, was found near the King Neptune. His dog made it to shore and his usual hang-out, the Marlin Club. But he did not. Condolences to his family and friends. Lessons learned and some observations? Here are a few from a single perspective. I am sure there are many other important lessons and observations from other points-of-view. First, the bravery, professionalism and competence of the Harbor Patrol, Baywatch and volunteers cannot be overstated. Without their efforts many more lives and much more property would have been lost. Our deepest condolences go out to the family and friends of Timothy Mitchell. At the first sign of a North East wind, even if forecast to be light, we will evacuate. This NE wind was predicted to be 5 to 15 knots. It topped out at over 40 knots. Cat Harbor is a good choice if you want to remain on the island during such a weather event. Big heavy boats are more prone to breaking the moorings and, once adrift, more difficult for the Harbor Patrol to control. These types of boats, especially if they are on the most exposed moorings, should be the first to evacuate the harbor. There are many reasons boats came off their moorings but several of the boats I saw adrift were due to failed moorings, not failed deck fittings. Some of the boats adrift, and on the beach, still had their mooring lines attached. However, one of the trawlers on the beach had its windlass ripped out. As did the Epic. Regardless, it is very important to securely attach the mooring line to your boat, add chaffing gear and check it frequently. When being washed onto a beach, don’t jump off a boat in the surf. Either evacuate before the boat hits the surf or ride it through. In mooring fields during storms, motoring out is not a good option. Just turning a large boat into the wind and seas in the confinement of the mooring filed can be a tremendous challenge. Once Susie Q’s propeller became fouled she was at the mercy of the elements. Much better to leave beforehand. Lastly, I am incredibly thankful my family was not aboard. I am a fairly strong swimmer and felt I could possibly make it through the surf, and even across the harbor, if I had to abandon ship. I would not assume that of my family members. With the seawall behind me riding the boat through the surf was not a realistic option. Of course, had my family been aboard, I would have requested they be evacuated. But in this emergency that likely would not have been possible. Many families requested to be evacuated and the harbor patrol simply could not get to them until after daylight when things calmed down. Hopefully these families are not overly scared by the ordeal and will keep returning to Catalina. For my family, Catalina is a very special place. My wife and I became engaged on the island. Our kids have been joining us since they were three weeks and five weeks old. We make many trips to the island every year including a two week annual cruise with Mission Bay Yacht Club. We will never look at Avalon Harbor in the same way as we did before December 30th, 2014. But our appreciation for Catalina and her residents have only increased. We will soon return. Daniel Sipes has been an active boater his entire life. He enjoys sailing, powerboating, fishing, SCUBA and freediving/spearfishing. He grew up on Bethel Island, in the California Delta. His parents had a marine electronics business and have been active in the U.S. Coast Guard Auxiliary for over 50 years. After graduating from California State University, Sacramento and UC Davis, his career took him to San Diego where, in his leisure time, he restored an old Seafarer 31 sailboat and sailed it solo from Mission Bay Yacht Club to Hilo, Hawaii, through the Hawaiian islands then to San Francisco, up to the Delta (visiting his parents’ house on the water) and finally returning to San Diego (MBYC). In order to more frequently visit Catalina he and his wife purchased a 34 Meridian power boat in 2004 and make the trip several times a year with their children. Daniel currently works as a biologist specializing in laboratory automation with Novartis Pharmaceuticals in San Diego. To me as a Professional mariner of 48 yrs someone did not monitor the weather as all professional do every 6hrs, forecast change but; because of tech knowledge have the ability to see want the weather has changed for the good and bad that’s about to come. As a Harbor Master in the procedures he should be every season change inspect mooring too and not trust the public to ensure all mooring are safe and dock mooring are done with the proper amount of line and the best leads that can be made while some vessel made need to be double up and the fenders of vessel arrangement to protect the dock as well as vessels. some times you must move larger vessel to a location which has a lee of high winds and seas.